imageHOLDERS have launched a new website to enhance their custom, tailoring and device integration services. We need to have the appropriate platform to encourage clients to see the different options that are available. 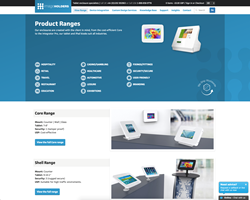 imageHOLDERS, a tablet enclosure and iPad kiosk specialist, have officially launched a new website and refreshed their brand identity. The new website aims to enhance the many services which imageHOLDERS offer their clients. The new website was designed and developed by mobile and digital specialists We Are Base, Dorset, with the premise to create a flexible site with global ecommerce reach, which can host the many different solutions and enclosures which imageHOLDERS have created since the company's launch in 1996. The new website enables customers and clients to better understand options regarding tailoring and alterations. These services allow businesses to brand their enclosure, fit a non standard tablet with imageHOLDERS patent-pending Universal Tablet Tray, or alter an enclosure to suit their unique needs. The device integration services section on the website is expanding to include the vast knowledge of the imageHOLDERS team. With established partnerships with OEM providers, and an inhouse design team who can create a bespoke solution, the device integration services offered are ever expanding, requiring the flexibility of the new website. The imageHOLDERS design service team work with clients from concept to creation, ensuring all specifications are met.